When League members predictably refused to budge on the ques­tion of equal­ity sta­tus for Germany’s armed forces, Hitler made the announce­ment to pull out of the inter­na­tional organi­za­tion to the delight of most Germans, who wanted to shake off, as he explained in a “rant” to Ameri­can ambas­sador William Dodd on Octo­ber 17, the indig­nities a vic­tim­ized Germany had faced at the hands of the vic­tors of the past world war. (Besides a shrunken mili­tary, the 1919 peace treaty required Germany and her co-bellig­er­ents to accept respon­si­bility for causing “all the loss and damage” the war had inflicted on the victorious Allied powers and to pay 132 bil­lion Reich­marks (equi­va­lent to 442 billion U.S. dollars in 2017) in repa­ra­tions to the winners.) Dodd, a former his­tory profes­sor, told a sud­denly quiet Hitler that war is always followed by injus­tice, and pointed to the example of the North’s “terrible” treat­ment of the Southern states after the U.S. Civil War. Hitler just stared back at the ambassador before changing the subject. Cunningly, Hitler told his countrymen that they would decide the League issue in a pleb­i­scite set for Novem­ber 12, 1933, a date chosen because it was one day after the fif­teenth anni­ver­sary of the armis­tice that brought the Great War to an end. With Hitler’s Nazi Party con­trolling the media and his storm troopers standing outside polling places, the outcome was never in doubt. Once again in 1933 the German elector­ate rati­fied Chan­cel­lor Hitler’s leader­ship and “demo­cra­tically” granted him his wish to with­draw Germany from the League of Nations and embark on a new, ambi­tious, and aggres­sive course for his nation of 66 mil­lion people. In 1935 Hitler intro­duced mili­tary con­scrip­tion, enabling the German Army to annually train 300,000 con­scripts, who, since August 1934, swore direct alle­giance to Hitler rather than to “the People and the Father­land.” By 1939 the German armed forces (renamed the Wehr­macht in 1935) had nearly 100 divi­sions of 1.5 million well-trained men and close to 8,300 mili­tary air­craft avail­able to as­sault neigh­boring Poland in the opening salvo by Hitler’s war machine to dominate all of Europe. Left: On January 1, 1921, Weimar President Friedrich Ebert officially established the German Reichs­wehr pursu­ant to the limita­tions imposed by the 1919 Treaty of Ver­sailles. The Reichs­wehr was limited to a standing army of 100,000 men and a navy of 15,000. 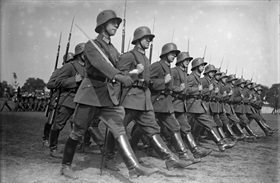 In this photo­graph, Ebert’s suc­ces­sor, Paul von Hinden­burg (out of camera range), reviews a parade march of Reichswehr soldiers in 1930. 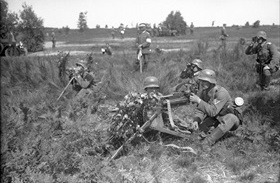 Right: This photo depicts Reichswehr soldiers manning a machine gun in a mili­tary exercise near Frank­furt on the Oder in Septem­ber 1930. Observing the exer­cise was Col. Gen. Wilhelm Haye, Chef der Heeres­leitung (Chief of the Army Com­mand) from 1926 to October 1930. Under Hitler the office would be called Ober­kom­mando des Heeres. The Ver­sailles Treaty forbade the estab­lish­ment of a general staff with over­sight over the army and navy. In 1938 Hitler created the Ober­kom­mando der Wehr­macht (Supreme Com­mand of the Armed Forces), headed by Field Marshal Wilhelm Keitel, who signed the German Instrument of Surrender on May 8, 1945, in Berlin. Left: Heavy weapons such as artillery above the caliber of 105mm (for naval guns, above 205mm), armored vehicles, tanks, sub­ma­rines, and capi­tal ships were for­bidden under the Ver­sailles Treaty, as were air­craft of any kind. Com­pli­ance with these restric­tions was moni­tored until 1927 by a mixed com­mis­sion of specialists from the United States, Great Britain, France, Italy, and Japan. 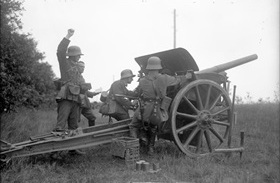 In this June 1931 photo an artillery unit practices firing shells. 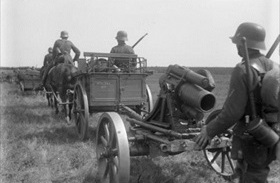 Right: This December 1930 photo depicts a Reichswehr mortar unit during an exercise.